The average cost of assisted living in Gonzales is $2,975 per month. This is lower than the national median of $3,346. To help you with your search, browse the 25 reviews below for assisted living facilities in Gonzales. On average, consumers rate assisted living in Gonzales 4.7 out of 5 stars. Caring.com has helped thousands of families find high-quality senior care. To speak with one of our Family Advisors about assisted living options and costs in Gonzales, call (855) 863-8283. Gonzales, Louisiana has a population of around 9,700, 10.2 percent of whom are seniors. The city is known as the "Jambalaya Capital of the World" and offers a myriad of quality eateries for seniors to enjoy, not to mention the annual the Jambalaya Festival. The area also has 12 assisted living facilities (ALFs), all regulated by the Louisiana Department of Health. ALFs in Louisiana are defined by state law as those facilities having two or more unrelated residents that provide assistance with personal care and daily tasks. The Gonzales, Louisiana area is home to world-class medical facilities including St. Elizabeth Hospital, in the event of medical emergencies or illness. The overall cost of living in Gonzales is five percent less than the national average. Seniors in the area will pay less than the national average for utilities and transportation. Gonzales has a sub-tropical climate, which means hot summers and mild winters. The average high temperature in Gonzales in January is 61 degrees Fahrenheit, and the average high temperature in July is 91 degrees. While the climate here is generally favorable for seniors, hurricanes can be an issue. Gonzales was most recently hit by Hurricane Isaac in 2012. Crime is a major problem in most parts of Louisiana, including the Gonzales area. Although the crime rate in Gonzales has decreased by five percent in recent years, it is still 209 percent higher than the national average, something that is understandably worrisome to seniors and their families. Interstate 10 cuts through Gonzales and connects the city to Baton Rouge to the northwest and New Orleans to the southeast. While there is no fixed public transportation system, the Ascension Parish Council on Aging provides on-demand transportation with advance reservations for residents age 60 and older. There is no charge for the service, but a donation is encouraged. Gonzales, Louisiana offers a number of cultural opportunities. In addition to the Jambalaya Festival, seniors can enjoy scenic Jambalaya Park and its many antebellum, historic homes and the nearby Houmas House Plantation and Gardens. Enjoying attractions in Gonzales doesn't have to break the budget; most events and attractions offer some type of senior discount. Assisted Living costs in Gonzales start around $2,975 per month on average, while the nationwide average cost of assisted living is $4,000 per month, according to the latest figures from Genworth’s Cost of Care Survey. It’s important to note that assisted living rates in Gonzales and the surrounding suburbs can vary widely based on factors such as location, the level of care needed, apartment size and the types of amenities offered at each community. 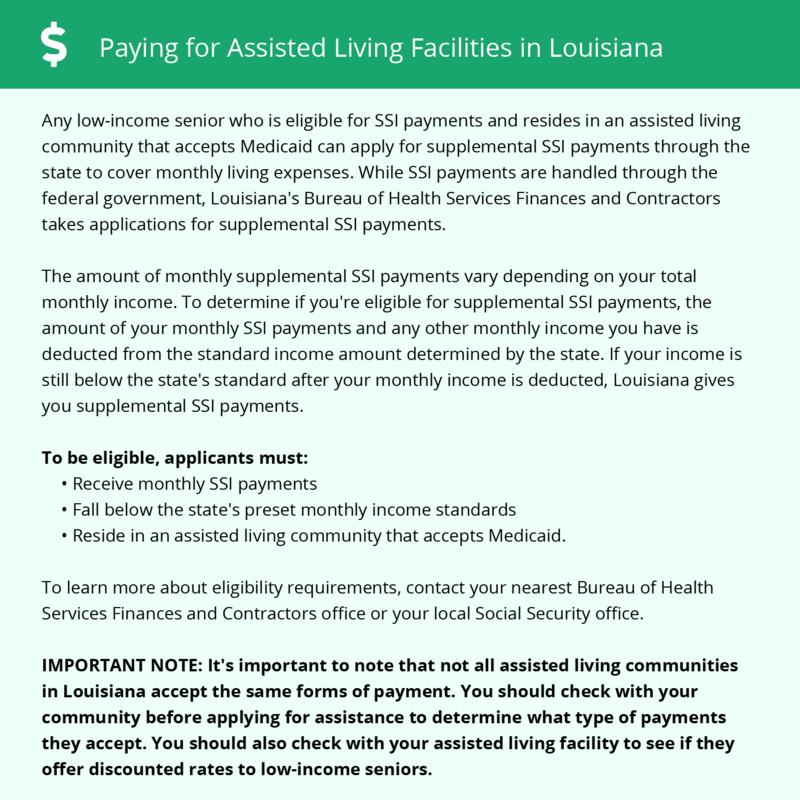 Gonzales, Louisiana seniors who meet the eligibility requirements can find a number of state and federal assistance programs to help with the cost of an assisted living facility. These include the Community Choices Waiver (CCW) and Supplemental Security Income Category G.
Gonzales and the surrounding area are home to numerous government agencies and non-profit organizations offering help for seniors searching for or currently residing in an assisted living community. These organizations can also provide assistance in a number of other eldercare services such as geriatric care management, elder law advice, estate planning, finding home care and health and wellness programs. To see a list of free assisted living resources in Gonzales, please visit our Assisted Living in Louisiana page. Gonzales-area assisted living communities must adhere to the comprehensive set of state laws and regulations that all assisted living communities in Louisiana are required to follow. Visit our Assisted Living in Louisiana page for more information about these laws.